No list of “fun English words” would be complete without a history lesson. Modern English is a mosaic, having absorbed linguistic elements from several different sources over the course of hundreds of years. Between 1,600 and 1,500 years ago, on a rainy island in the Atlantic on the periphery of the Roman empire, a Celtic-speaking people known as the Ancient Britons first encountered a small band of foreigners from the Germanic regions of Angeln and Saxony. Romans were abandoning this far-flung outpost; they had more pressing issues to deal with closer to the heart of their empire. Once the Romans had abandoned the island, the resultant political vacuum made the constantly-warring Celtic tribes easy prey for the next conqueror. Consequently, the 5th century encounter between Celts and Anglo-Saxons was the first step in what would be the latter’s gradual settlement of and rule over what is today Britain. While Jutes and Frisians from Denmark were also settling on the island, it was the Anglo-Saxons who came to dominate it politically. Anglo-Saxons spoke a Western Germanic language, extremely similar to the Frisian languages spoken in the Netherlands and fairly similar to German, Dutch, Danish, Norse, Swedish, and even Icelandic. The Anglo-Saxons’ language, “Old English,” eventually supplanted the once-dominant Celtic language of the Ancient Britons, although people in the regions now known as Wales and Cornwall persisted in speaking their Celtic mother tongues. While Welsh still has hundreds of thousands of native speakers, Cornish is recently extinct, although there are efforts to revive it. During the Anglo-Saxon invasion, some of the indigenous Celtic-speakers escaped to the northwest of France, settling in the area that is modern Brittany. Their descendants still speak a Celtic language, even though the majority of France speaks a Romance language. Less closely-related Celtic languages survived in other places too; the Gaelic (Goidelic) members of the Celtic branch are still in existence, but are endangered, as English has become dominant. The most well-known of these are Irish Gaelic, Scottish Gaelic, and Manx. 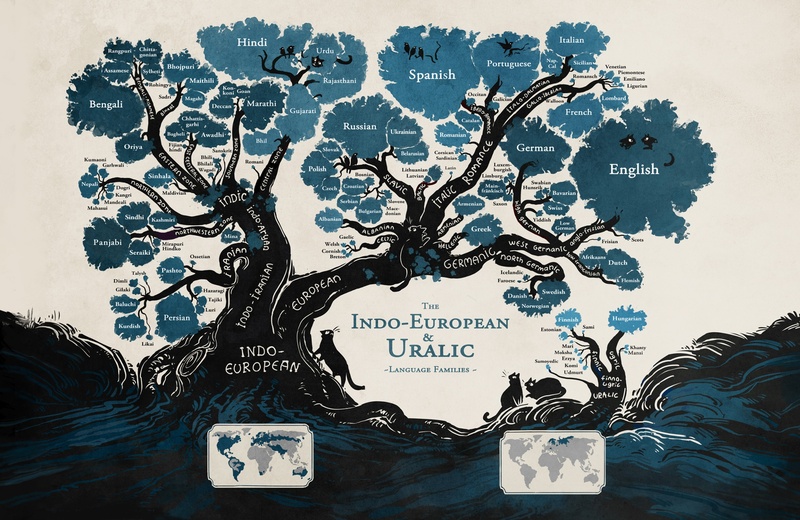 Note: I’ve already mentioned several Indo-European subfamilies, and if you’re having trouble visualizing the relationship among them, I recommend looking at this lovely (if a little simplified) language family tree created by Finnish-Swedish graphic artist Minna Sundberg. It clearly illustrates that English is part of the Germanic branch, and, more fascinatingly, that it is distantly related to a wide variety of languages such as Farsi, Hindi, Russian, Armenian, and Greek. This was by no means the end of English’s evolution. In 1066, the Normans launched a campaign from France and ended Anglo-Saxon rule, ushering in a new wave of linguistic changes. Interestingly, as their name suggests, Normans were Norse Vikings, and originally spoke a Germanic language related to English. However, when these Norse Vikings settled in the northern region of France, in what is today Normandy, they came into contact with Gallo-Romans. Eventually, Normans adopted the Gallo-Roman language, and the result came to be known as Norman French. Once these French-speaking Normans conquered the island of Britain, they exerted a huge influence on, but did not eliminate, English. The power dynamics between the Normans and the conquered Anglo-Saxon populace is reflected in the stratification of English’s lexicon. Anglo-Saxons were the farmers raising animals, and the ruling Normans were the nobility consuming the product. To this day, Germanic words are used to describe the animal, and Romance words, the food. Consider swine versus pork, cow versus beef, lamb versus mutton, and chicken versus poultry. Now compare these words to their German and French equivalents: schwein versus porc, kuh versus boeuf, lamm versus mouton, and küken versus poule. Of course, many basic concept words, numbers, and personal pronouns also remained Germanic. Britannica gives numerous examples, such as heaven, earth, love, hate, life, death, beginning, morning, day, night, month, year, heat, cold, way, path, east, west, wife, brother, mother, father, meadow, stream, hunger, thirst, water, bread, flesh, etc. Many high-frequency verbs also remained Germanic, including, but not limited to, drink, eat, think, speak, meet, see, swim, go, and want. But there was soon to be another incursion of Romance language into English that would help ensure that the decisive majority of English words are Latin-based. In the 1700’s, many scholars in London decided that Latin was a supremely logical language and that some of its rules should be applied to English. MIT professor Steven Pinker succinctly explains the situation: “Latin was considered the language of enlightenment and was offered as an ideal of precision and logic to which English should aspire. The period also saw unprecedented social mobility, and anyone who wanted to distinguish himself as cultivated had to master the best version of English…Most of the hobgoblins of prescriptive grammar (don’t split infinitives, don’t end a sentence with a preposition) can be traced back to these eighteenth-century fads.” The reason it feels natural to say “to quickly eat” and “to boldly go” is because there is no reason you shouldn’t split English’s two-element infinitives (to + bare verb). In Latin, this rule makes much more sense, since it is impossible to split Latin’s (and, by extension, Romance languages’) one-word infinitives. This is all to say that there were concerted efforts to alter English grammar in an unnatural way, with somewhat limited success. After all, it is almost every English speaker’s instinct to violate some of the Latin-inspired prescriptive grammar rules, which are only mastered with repeated in-school drilling (i.e. not the way natural language is acquired). However, incorporating Latin/Latinate and Greek scientific, artistic, political, and philosophical terms into English was much more successful. As a result, Modern English is chock-full of such words. Open a medical textbook, and you’ll see that almost all anatomical and epidemiological terms originate in one of these Classical languages. While these are the forces that have spurred on the most dramatic changes in the English language, there are still several other historical events that have left no small impact. These words describe things that are native to the Americas (that’s right—until recently, Italians did not have tomato sauce, the Irish didn’t have potatoes, and the Swiss didn’t have chocolate!). Since these plants and animals did not exist in the Old World, the words were readily borrowed from native sources. Of course, another important group impacted the English of the United States—a group that built much of the country’s agricultural infrastructure; developed jazz, blues, funk (and, by extension, rock); made important culinary innovations; and have played a role in many other sectors of American society, including science and politics. African-Americans, enslaved and brought to the Americas to work on plantations, have had an indelible, if relatively smaller, impact on American English. Words like jumbalaya, juke, jumbo, yam, banjo, banana, zombie, gumbo, mumbo-jumbo, goober, jazz, jamboree, cola, and many more have made their way from the Niger-Congo languages spoken by slaves into English. The majority of English grammar and approximately 25% of English vocabulary—usually, the most frequently-used, basic words—is Germanic in origin, about 65% is Romance, and a smaller but substantial portion is comprised of scientific words from Greek, as well as food, animal, and plant terminology from West African and Native American languages. An imperfect analogy would be to think of Modern English as a person, with Germanic as its skeleton, Romance as its muscles and skin, and other sources (of which I have provided a mere sampling) as its clothing and accessories. With the rich background of English fresh in your mind, enjoy perusing this list of fun English words of various origins! caterwaul: to make a harsh cry or complain noisily; to cry like a cat. The root of this word is unquestionably Germanic, though whether from Dutch or Low German is unclear. filibuster: Originally Dutch for “pirate,” this word now refers to a tactic in which Senators in the U.S. Congress talk continuously in order to hold the Senate floor and prevent voting on a bill. gumbo: Louisiana, and New Orleans in particular, is characterized by its Creole culture, birthed by the mixing of Africans, Native Americans, and Europeans. Gumbo is arguably the most famous Creole dish in the USA, and its key ingredient is okra. Okra seeds, as well watermelon, kidney and lima beans, yam, black-eyed peas, sesame, millet, rice, and cassava seeds were brought to the New World along with African slaves. Speakers of the West African language Mbundu call okra ki ngombo. Slaves derived gumbo from this term, and it eventually came to denote the okra-filled stew (which also includes shellfish, celery, bell peppers, onions, rice, andouille sausage, tomatoes, and numerous Creole spices). It’s a must-try for anyone traveling in the southeast of the USA. goober: former usage: “peanut”. Modern usage: a silly or foolish person. The story of the goober is a convoluted one. Peanuts are indigenous to South America, but they made their way to North America via Africa. Hence, West Africans developed their own word for the tasty nut before it reached North America. In the Bantu languages Kikongo and Kimbundu, the word for peanut is nguba. Eventually, this became “goober,” and it was quite common to hear American southerners use it to refer to peanuts. The word shifted semantically quite a bit before arriving at its current meaning. hooligan: a violent young troublemaker. The main theory about this word’s origin is that it stems from the last name of a fictional Irish family in an 1890s music-hall song. Its first appearance in text is purported to have been in a British newspaper. O’Houlihan is the Anglicized version of the Irish Gaelic family name Ó huallacháin. circumambulation: to walk around something. This word has a pretty straightforward etymology: Latin circum meaning “around,” ambulus meaning “walk,” and ation, a noun suffix for an action or process. haberdashery: In its contemporary usage, this word means “a person who deals in hats,” but it used to encompass a wider variety of goods. Scholars hypothesize that it is from Anglo-Norman French hapertas. gubernatorial: relating to a governor. This word is one of many examples of political vocabulary with Latin roots. In this case, it’s from gubernator, which, unsurprisingly, means “governor”. toboggan: A toboggan is a light sled used on ice or snow. This word comes from Micmac, a language in the Algonquian family, which is one of the largest extant Native American language families in the USA. The word entered American English through Canadian French. Somehow, it also came to be associated with a style of long, knitted, wool hat. For the most part, its use is geographically restricted to the USA and Canada. Of course, English is far from the only language to be composed of multiple elements. Nevertheless, its widespread usage, and the myriad peoples who have come into contact with it and/or adopted it, have rendered it full of delightful layers and surprises. Uncommon Foreign Nouns and Names: To Translate or Transliterate?